Congratulations to Heather B who won the KitchenAid hand mixer. Attendees are invited to come eat, enjoy the Del Webb lifestyle and enter to win KitchenAid® small appliances. You can find out more information, find locations and RSVP for events at the Del Webb Facebook page. Del Webb is also sponsoring Cooks for the Cure as part of the event’s 10th anniversary, which challenges America to host 1,000 dinner parties to raise money for breast cancer research and community outreach programs. The annual event has raised nearly $8 million since 2001 for Susan G. Komen for the Cure. As part of this, Del Webb is also challenging Yellow Tennessee readers to host a dinner party to raise money for Susan G. Komen. 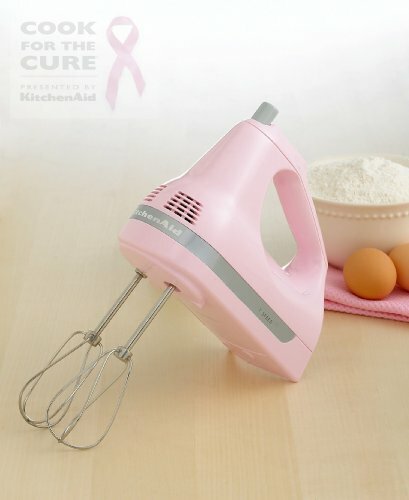 But there is more, one lucky Yellow Tennessee reader will win their very own Cook for the Cure edition, pink KitchenAid hand mixer. Mandatory Entry: Share your favorite ‘pink’ recipe that you would share at your 1000 Cooks for a Cure dinner. The recipe itself does not have to be pink colored, but it does have to be something that you would serve at your dinner party. You can either leave a comment here with your recipe or share it on Del Webb’s FB wall and leave me the link in a comment. Extra Entries: You must complete the mandatory entry for any extra entries to count. Please leave a separate comment for each entry. * Like Del Webb on Facebook. * Become a Follower of Yellow Tennessee (at the bottom). * Like Yellow Tennessee on Facebook. * Follow Yellow Tennessee on Twitter. * Follow Yellow Tennessee via email (on the sidebar). * Grab my button and place on your blog (on the sidebar). * Post about this giveaway on your blog (linking back to me). Three extra entries. * Post about this giveaway on your Facebook page. (include @Yellow Tennessee) One extra entry daily. * Enter one of my other giveaways. (found on sidebar). Two extra entries. * Leave a comment on any of my other non giveaway posts. Can be done for up to 10 extra entries. Be sure to let me know what post you comment on. Entrants 18 and older and from the US are eligible. Contest Ends on August 3, 2011 at 12:00pm CST. Winner will be chosen by And The Winner Is… and announced on or around August 4th. Winner will be notified by email with “You Have Won the KitchenAid Giveaway” in the subject line. Winner will then have 48 hours to respond before a new winner is chosen. Disclaimer/Disclosure: I received no compensation for posting this information and giveaway. All views and opinions are my own. All logos and photos are property of Del Webb and KitchenAid and were used with permission. By posting your recipe you give me permission to share it with Del Webb on Facebook. Rachel Akers writes about crafts, recipes, and features the adventures of a family of 4. It is always crazy but I wouldn't change it for the world! Comments or questions? Talk to me on Facebook or Twitter or sign up for our RSS feed to have future articles delivered to your feed reader. Hello, I am Rachel. Wife, mom, blogger. Welcome to my world, Yellow Tennessee. Yellow Tennessee is a participant in the Amazon Services LLC Associates Program, an affiliate advertising program designed to provide a means for sites to earn advertising fees by advertising and linking to Amazon.com. All links on this site may be affiliate links and should be considered as such.